Let us handle all of your Amazon inventory. We will prep it, pack it and ship it to FBA. Thanks to our strategical location next to one of the biggest inland intermodal terminals for container handling operations in Central Europe (PCC Kutno) and a short distance to Amazon Fulfillment Centers in Poland, Czech Republic and Germany; we can provide fast and cost-effective FBA prep services for all e-commerce sellers who import their inventory for the European marketplaces (Amazon.de in particular) from China, Far and Middle East by sea (e.g. via Port of Hamburg or Bremen Ports), rail, air or using road solutions. and many other popular marketplaces in Europe. We are located in the Eastern European Union, in the city of Kutno, Poland which is situated directly on the railway line E-20, connecting Europe with China - Berlin with Warsaw, Moscow and Chengdu in the Chinese province of Sichuan (with further connections to any city and sea port in the Far East); near to the main railway line north-south (No. 131) on the Baltic-Adriatic Corridor and very close to national roads and motorways: A1, A2 Motorway, DK 92, DK 1, DK 60. Shuttle, direct train connections from sea ports and land terminals in Germany: Hamburg (5 times a week), Bremerhaven (5 times a week), Duisburg (3 times a week); the Netherlands: Rotterdam (daily); Belgium: Antwerp (3 times a week) and even the United Kingdom. 3 times a week, soon daily, rail line from CHINA. It will take only 10-11 days to import your goods to the EU from Far East by direct train connections instead of sea freight which is usually over 30 days. Plus rail connections to Ukraine, Belarus, Russia, Kazakhstan. Polish sea ports - Gdynia/Gdansk (22 connections a week) - especially cargo in the north-south trade corridors (from Scandinavia and Far East). This combined with road freight or railway cargo hubs in Germany, Sweden, Italy, France and Denmark allow us to transfer your inventory to and from any address around the world on a regular basis and at a competitive price. Approximately 185 km / 115 miles to Amazon Fulfillment Center in Poznan (POZ1) which supports Amazon marketplace in Germany. Approximately 215 km / 133 miles to Amazon Fulfillment Centers in Wroclaw (WRO1, WRO2, WRO3, WRO4), Poland which mainly serve German marketplace. Approximately 435 km / 270 miles to Amazon FC in Kolbaskowo (SZZ1). Approximately 248 km / 154 miles to Amazon FC in Sosnowiec (KTW1). Approximately 435 km / 270 miles to Amazon Fulfillment Centers in Prague (PRG1, PRG2), Czech Republic which operate for German marketplace. Approximately 490 km / 304 miles from Amazon Fulfillment Center in Leipzig (LEJ1). Approximately 440 km / 273 miles to Amazon Fulfillment Center in Berlin (BER3). More Amazon Fulfillment Centers in the region are coming soon. Don't worry, we work with sellers of all sizes. Big and small. And we will help you grow even faster. How much does it cost to ship a package from our warehouse to Amazon Fulfillment Center? Pricing based on the sample carton box, regular shape, 50x50x50 cm, up to 30 kg. Shipping provided by a courier company with online tracking system. SELL ON AMAZON IN EUROPE WITH US! Are you a manufacturer, an importer, distributor and wholesaler? Do you want to sell on all 5 Amazon marketplaces in the European Union? Contact us today! We can provide you with all you need (including local VAT and customs) to start selling your products on Amazon in Germany, France, Spain, Italy and the United Kingdom. Cross border e-commerce logistics for sellers from China! The “FBA Warehouse Delivery Europe” aka "Amazon FBA Forwarding" is a logistics product, which FBA sellers from China may find especially useful. Our All Inclusive package is a complete set of services designed for Amazon sellers from outside the European Union. It offers EXW, FOB or CIF freight transportation from China through our partner carriers, customs clearance, FBA prep & inspections, short and long term warehousing and forwarding to FBA warehouse in any country in Europe (Germany, Poland and Czech Republic in particular). We will take care of all logistic handling of your parcels, pallets or containers in Europe as well. Fast, reliable and effective. To ensure safe and seamless flow of operations from China and across Europe. We will help you optimize a supply chain deliveries for “Small-Parcel Delivery” as well as “LTL/ FTL-Delivery” transports. • Customs brokerage service in Poland - selected cooperation partners in China and in Poland, ensuring a swift customs clearance within a matter of hours, when customs declarations information transfer is done prior to arrival of cargo. • Professional distribution partners for FTL and LTL deliveries in Europe showing tracking information along the whole route. • Localized after-sales services - sister companies in Germany, the UK, the Netherlands with experienced staff members familiar with local circumstances. • Electronic data exchange with per-to-per encryption for the exchange of sensitive documents, thereby minimizing loss of data and avoiding repetition of identical work steps. Your first shipment is on us*! 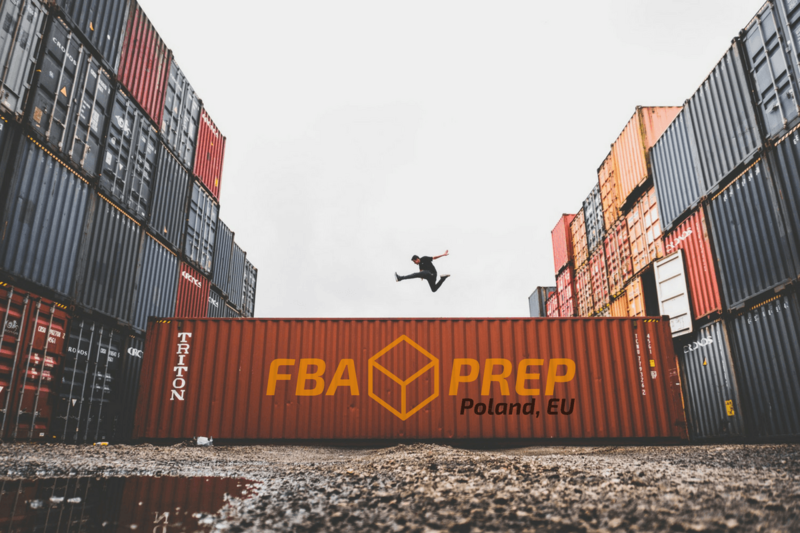 * we won't charge for your first order with FBA prep Poland for up to 50 units; the cost on shipping etc. is paid extra. Anything that takes you away from the activities that produce value for your online business. We have carefully built a network of trusted and reputable shipping partners in the European Union which allow us to offer highly discounted deliveries and transfers to any warehouse or fulfillment center in Europe. The fastest form of international shipping. When time matters most. Save money on your cargo with larger shipments. We can handle all trucking within the European Union to the Amazon warehouse. Transport your cargo to Europe from China in 10 days! Let us handle all the paperwork and never worry about fines again. Listing, labeling, bundling, inspections. That's what be love the most! Keep your hands-off inventory and focus on your core business. Free with most orders, we can check for quality issues. Complete Amazon-ready packing for your products. We can drop in manuals, marketing inserts, and more. Combine items into a single bundle at affordable rates. Just name it. We’ll do the rest. End-to-end logistics for your Amazon FBA inventory. Eliminate the hassle of handling your removal orders from Amazon. We will take it, store it and re-ship it to you whenever you are ready. Store your products while you work out the details to make your products live. Avoid Amazon’s storage fees with our significantly lower rates. Additional Long Term Storage Fee every 90 days - 300 EUR per effective cubic meter. Your Amazon returns directly to us, and we will forward them to you. Expiration labels, product information inserts, hang tags installation, additional labels? Just name the activities you need, we'll done it all for you! Your dedicated project manager is here to help you with all of your challenges. No prep needed? We can accept your shipment and redirect it to Amazon. Professional, Amazon-compliant photos of your products. Pack your products on pallets and enjoy reduced LTL shipment pricing. Let us save you time by logging into your account for labels and more. We handle everything from receiving, inspecting, processing, labeling, packaging and shipping your Amazon FBA inventory. Place your order and ship to our address. Input shipment details into your account's spreadsheet (e.g. product description, ASIN, preferred MSKU, quantity). NOTE: Shipping address and spreadsheet are shared at time of sign-up. We receive, count and inspect your inventory. You'll also be able to check the status of each of your items at any time via our shared spreadsheet. If any urgent problems arise, we'll contact you directly and share photos of any damaged items. We advise you to share Seller Central sub-account access with us so we can print shipping labels on your behalf. We prep each item to FBA standards and apply a FNSKU label. In your Seller Central sub-account we create an FBA shipment, get FNSKU labels and create shipping labels. NOTE: You can also send us FNSKU labels in advance if you do not wish to share sub-account access with us. Share your Seller Central sub-account access so we can print shipping labels on your behalf. We pack your items and upload box content information to Seller Central. If you've granted us sub-account access to Seller Central (Manage FBA Shipments privileges only), we will print shipping labels on your behalf and ship off to Amazon. Otherwise, we will send you the shipment name and box weight/dimension information so you can print the shipping labels and send them back to us. NOTE: Same-day turnaround is normally only possible through the use of a Seller Central sub-account! Simplicity and flexibility are the key to success in e-commerce. No surprises. And we mean it! Just starting out on Amazon? Your FBA won't get any easier! Suites best for up to 10 outgoing boxes. Let us handle all of your storage, inventory, prep and shipping while you focus on sourcing your products and building your brand only! • Storage - free for up to 21 days, than 15 EUR per effective Cubic Meter (0,30 EUR per Cubic Foot) for every 30 days, max 90 days. Additional Long Term Storage Fee every 90 days - 300 EUR per effective Cubic Meter. Take advantage of our cheap long term storage fees by storing excess inventory at our warehouse and send it to FBA when needed. If your products are oversize (18"+ or as indicated by Amazon) or contain less than 10 units per carton, please contact us for a personalized quote. Our asking price is 0,5 EUR per unit. Everything included! Application of FBA item labels to products. Additional packaging layer for liquids, special products or fragile items. Do you need simple forwarding only services? We will receive, inspect (external), make an inventory and ship it. Do you want us to take photos of your inventory for Amazon Product Detail Pages? All photos (main image, additional images, bundles) are made by professional photographers and meet Amazon's requirements for style, size, proportion and a pure white background. Having a problem with existing inventory at Amazon FBA? We will receive, inspect, correct and ship your inventory back to Amazon or anywhere you want. Haven't found what you are looking for? Please contact us now - we will provide you with an individual offer ASAP! If you still don't find the answer you need, please use our contact form. What products are considered oversize? We use the same size and weight standards as Amazon uses with its FBA program. Individual units exceeding 18 inches on the longest side or greater than 20 pounds in weight will be charged as oversize. How are shipping charges billed? Shipping charges from Amazon-partnered carriers such as UPS are charged directly to your Amazon account. In order to get the correct shipping rate, be sure that the 'Ship From' address in your shipping plan is changed to our warehouse address. When using our partner common cariers and shipping companies you will be charged by them directly or we can add your fees to the final bill with us which will incur a 5% surcharge. How fast can you prep and ship my items to Amazon? We are normally able to prep and ship received inventory in 24 hours (1 day) after receiving your products. However, if we receive inventory towards the end of the day, it will be shipped the next business day. How to create your shipping plan in Amazon Seller Central Account? Log into your Amazon Seller Central Account and create an abbreviated Shipping Plan for your next shipment. Just list the products and the quantities, then stop. Amazon will automatically save your work. How does sharing Seller Central shipping plan permissions work? 1. Create an email (e.g. with Gmail) that you can use for the sub-account you will share with us. 2. In Seller Central, click "Settings" (found at top-right of the screen) then "User Permissions". 3. Under "Add a New Seller Central User", add the sub-account email you created in Step 1 and click "Send invitation". 4. Accept the invitation in the sub-account email. 5. Afterwards, you will be able to select the level of permission granted. You need only select Inventory > "Manage FBA Inventory / Shipments" and click "View & Edit" then save. Can you store my inventory? With our Standard FBA Prep services you have 14 free days, which starts when the product arrives at our warehouse. We offer 21 days of storage free of charge for our Wholesale & Private Label Clients. We can store your inventory until you’re ready to send it into Amazon. After that, we offer storage for 0,42 EUR per effective Cubic Foot (15 EUR per effective Cubic Meter) for every 30 days. For non-prep orders, storage is 15 EUR per effective Cubic Meter for every 7 days. I'm planning to order product from overseas. Can you handle customs/duties for me? Yes, we work with several reliable shipping agents who will be able to assist you with your international shipping and customs matters. There is a charge of 25 EUR when we assist you with the customs e.g. by setting up importer's account. Can you handle my unpaid customs or duties charges? Yes, in the case that the customer does not pay for the customs and duties up front and the bill is sent to us, we will pay the duty fee and charge a 25 EUR service fee. The duty and customs fees will be added to the final bill. Anything over 100 EUR will incur a 5% surcharge. After we do our part, you will receive an invoice by email, due immediately, for the total units in the completed shipment. The 1st order is to be paid by a wire transfer. Later on - invoices can also be paid by money transfer or credit card onto PayPal account (extra charges may apply). Do you work with International Sellers? Yes, we work will sellers from all around the world. Yes, we work will sellers of all sizes, big and small. All of our deliveries and transfers are registered with online tracking systems. No matter where you are, you may keep an eye on your inventory on the move 24/7. We work with any other marketplaces as well. eBay, Rakuten, Cdiscount, Zalando, PriceMinister. No excuses. We will handle your inventory efficiently and cost-effectively and ship your products FBA-ready to fulfillment centers across Europe and beyond. Do you work in logistics business? Do you run a blog or a popular group on Facebook about selling on Amazon, importing goods from China? Do you have some ideas on how we can work together? Let's get in touch and discuss on how we can express our gratitude for promoting FBAprep-Poland.eu services among your customers, suppliers, readers, users and partners. © 2017 All Rights Reserved / Alle Rechte vorbehalten.